Spirometry forms an important component in the diagnosis and management of pulmonary diseases in children and can be reliably performed in children as young as 2 - 4 years of age if adequately prepared. [1-5] The reliability of spirometry requires adherence to strict standards with regards to equipment, data acquisition and interpretation. Standards have been published for older children and adults;[5,6] however, both preschool and school-age children may have difficulty in meeting the quality-control criteria as set out in this guideline, hence the need for a paediatric-specific guideline. For this guideline, we reviewed the current literature on spirometry in children which included: a PubMed search of clinical trials on paediatric spirometry, a review of current American Thoracic Society (ATS) spirometry guidelines, European Respiratory Society (ERS) guidelines and the combined ATS/ERS task force guidelines. Each of the reviewers was allocated a section to review and any disagreements were resolved by consensus. The different sections were placed together in a working document and the guideline was sent to an independent reviewer for external review. To discuss specific aspects in paediatric spirometry, which include: indications, methods and the interpretation of spirometry in children <12 years of age and to provide a guideline to healthcare practitioners in the South African context. Prior to performing spirometry, adherence to some basic principles is necessary in terms of equipment care and use. All instruments should be calibrated or verified according to the manufacturer's recommendations and basic infection-control measures should be taken. 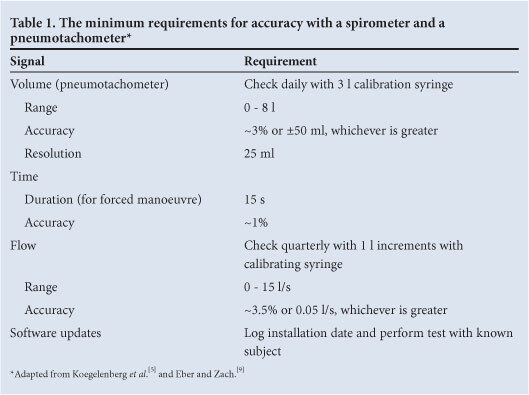 For accurate spirometry, equipment should meet the standardised recommendations for equipment accuracy and reliability (Table 1). [4,5,9] Equipment should be calibrated routinely or verified according to the manufacturer's recommendation with this documented in the laboratory logbook. The accuracy of the calibration syringe should be checked annually. Visual inspection of the flow-volume curves and volume-time curves is essential for assessment of quality. It is optimal for the operator to be able to view these on screen during the test, but at a minimum before the next attempt. Ideally, the display should show forced vital capacity (FVC), forced expiratory volume in time, t (FEVt), back-extrapolated volume (VBE) and time to peak expiratory flow (PEF). In preschool children, because they may expire their vital capacity in <1 s, FEV in 0.5 s (FEV05) should be displayed as well as the commonly used FEV in 1 s (FEV1). Hygienic measures are an essential part of the routine when dealing with spirometry. This includes universal control measures, such as hand washing and following the manufacturer's recommendations for cleaning of the spirometer. It is critical to keep the spirometer dry as fungi and bacteria thrive in moist environments. The use of bacterial filters between patients is mandatory to prevent contamination of equipment, as well as for the protection of the staff performing the spirometry. This is to prevent the spread of infectious diseases, in particular tuberculosis, which is highly prevalent in South Africa. The use of disposable filters is strongly encouraged. Where re-usable filters are used, correct cleaning should be performed with agents recommended by the manufacturer, and filters should be allowed to dry completely before use in subsequent patients. Spirometry is a physiological test undertaken to assess the lung volume (both inspiratory and expiratory) of an individual measured as a function over time. 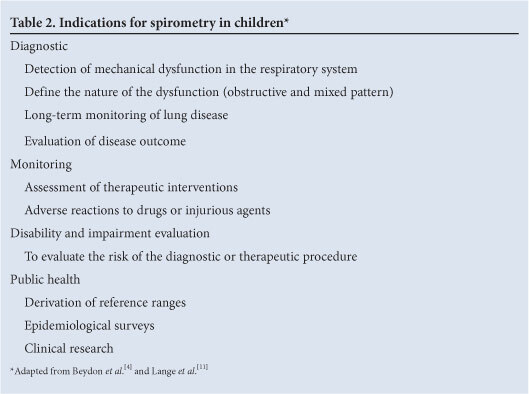 Spirometry is performed for a variety of reasons (Table 2). Although spirometry is a valuable tool, alone it does not provide an aetiological diagnosis, and should be taken in the context of the history and the clinical presentation of the individual being assessed. • a ≥20% decrease in sequential FEV1 or FVC measurements on the same day. To obtain useful measurements, co-operation during spirometry is necessary. An initial period of training is essential. [4,7,12] It is recommended to start testing patients at a young age as this provides training in good spirometry performance, which may lead to better results at an earlier age. Personal information such as height, weight, age, gender and racial group should be recorded for each patient. [11,14] This information is necessary for the use of appropriate reference equations. The recently updated Global Lung Initiative (GLI) reference equations are the most comprehensive and should be used as they take into account the impact of racial differences in different population groups worldwide. Children need to wear comfortable fitting clothes that do not impede their ability to inhale or exhale maximally. They should be in a seated position, allowing for less movement and interference with the test. In addition, most reference data are collected in the sitting position. The standing position should be avoided as this may lead to larger FVC values, especially in obese patients. A nose clip should be worn,[2,11,20] but is not necessary if it does not fit properly or if it causes discomfort or anxiety; however, use, or lack thereof, should also be documented. A finger pinch of the nose is acceptable as long as this forms an adequate seal to the nose. The patient's neck needs to be held in a neutral position with neither hyperextension nor flexion. [2,21] The patient's mouth must be closed tightly around the mouthpiece and there must be no air leak from this seal. This may be problematic in patients with severe neuromuscular disease. In these cases, manual assistance may be mandated to obtain a good seal. There should be no chewing, vocalisation, swallowing, coughing or occlusion of the mouthpiece with the tongue, lips or teeth. If the child is unable to achieve an adequate FVC but has a good rise on forced expiration, valuable information may still be obtained from the FEV1. If the child is unable to perform spirometry adequately, he/ she should be given active encouragement, as this may enhance the chances of performing spirometry in future sessions. The technologist must first demonstrate the procedure (Table 3) using child-friendly language and strategies. The procedure may be either an exhalation-only manoeuvre only or an inhalation-exhalation manoeuvre, depending on the equipment available and information required. The child assumes the correct posture, puts the mouthpiece in his/her mouth and puts on the nose clip or closes his/ her nose with a finger pinch. It is important for the technician to inspect for any leaks around the mouthpiece or blocking of the mouthpiece by the tongue. The manoeuvre is begun with normal gentle tidal breathing. The child then takes a full, deep inspiration, aiming for total lung capacity (TLC), and then immediately gives a maximal 'blast' of expiration and a full exhalation, i.e. carries on breathing out until there is no air left. The technician can be guided by the flow-volume curve and should encourage the child to 'keep going' until the curve has flattened, denoting a volume plateau. Attaining a volume plateau is more important than the exhalation time in children. Children are likely to have a shorter forced expiratory time (FET) than adults and hence the volume plateau may be completed in a shorter time: 3 s in children <6 years of age and 1 s in smaller, preschool children. [4,23] Throughout the procedure the technician must ensure that there is no leak at or obstruction of the mouthpiece while the child exhales immediately after maximal inspiration using maximal effort and exhales fully to the end of test. The technician's assessment of the manoeuvre quality must be recorded. This is important in the analysis of the test. At least three repeatable forced expiratory manoeuvres should be recorded. For young children, two acceptable and reproducible curves are recommended rather than three (Fig. 1). A manoeuvre is technically acceptable if it has an unhesitating start, is free from artefacts and shows satisfactory exhalation (Table 4). An acceptable start of test demonstrates a rapid rise to PEF as seen as a sharp rise at the beginning of exhalation on the spirograms. The start of the test is quantified by the VBE. In children it is recommended that the VBE should be <12.5% of FVC or <80 ml, whichever is greater, which differs from the VBE of <5% FVC and <150 ml required for adults. [5,23] The volume-time and flow-volume loops generated should be free of artefacts. This includes no coughing, glottic closure or occlusion of the mouthpiece. Finally, there should be a satisfactory end-of-test - a maximal exhalation until no more air can be breathed out. For diagnostic purposes there have to be two or three acceptable spirograms in preschool or school-age children, respectively. Repeatability is the closeness of results of repeated measurements and is achieved when the difference between the largest and next largest FVC is within <0.10 l or 10% of FVC with an FVC of <1.0 l or <0.150 l for FVC ≥1.1 l.[4,5] Large variability between measurements is often due to incomplete inhalations or suboptimal efforts. At a minimum, the two or three best FVC manoeuvres should be saved for analysis. Although children may tire with repeated attempts, it is often necessary to attempt ≥10 manoeuvres, provided that the child is not distressed or uncooperative. If the child is upset or distressed, testing should be stopped and the child praised for their effort. This will ensure possible satisfactory spirometry in the future. The highest FVC and FEV1 from any of the acceptable manoeuvres should be reported. Flows should be reported from the manoeuvre with the largest sum of FVC and FEV1 or FEV05, if FET <1 s.
A bronchodilator response is an important test for demonstrating airway reversibility. An airflow reversibility test is performed using 400 µg of ß2-agonist via a spacer device. The spirometry manoeuvre is then repeated as above after a minimum waiting period of 15 min. Recent reports have shown that maximal bronchodilator response occurs longer than 15 min after bronchodilator administration and probably a minimum waiting period of 20 min is preferable if possible within a busy clinic setting. An increase of FEV1 and/or FVC of ≥12% or >200 ml confirms bronchodilator response. [24,26] However, the lack of response to a bronchodilator in the laboratory does not preclude the lack of a clinical response. In young children, an increase in percentage from baseline rather than absolute volume is likely to be more useful. The use of flows such as the maximal expiratory flow (MEF) after 25 - 75% of expired FVC (MEF25-75%) is not useful for measuring bronchodilator response, as these indices show high variability. In addition, they are based in part on the FVC and therefore are not interpretable if the FVC changes with a bronchodilator. They have also been found to have little clinical utility in adult patients with obstructive airway disease. Negative results do not exclude the use of a bronchodilator or the diagnosis of asthma. It may be useful to repeat the test during an acute exacerbation. 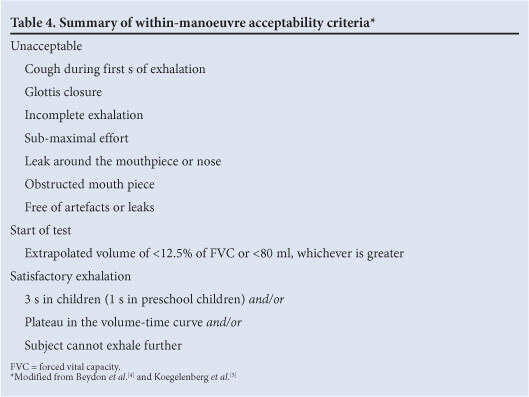 Bronchodilator responsiveness testing may be performed using various other direct and indirect challenges, but these are beyond the scope of this guideline. Pulmonary function testing varies with age, gender, height and ethnicity and therefore needs to be compared with predicted values appropriate for the individual being tested. A plethora of spirometric equations have been published (http://www.lungfunction.org/tools.html); however, there remains a paucity of suitable equations for the South African population with attempts to correct for ethnic differences being over-simplistic, especially among younger children. In addition, few equations take into account the changes that occur with height during the adolescent growth spurt,[30,31] with many equations being limited to different age groups. This lack of continuity across ages has been addressed in the new equations published through the GLI. These equations use large numbers of participants from 33 countries across the whole age range (3 - 95 years) and use of up-to-date methods. The equation is limited by the fact that it currently does not include data from Southern African populations; however, it is currently the most robustly developed equation with continuity across ages. Until Southern African data have been included in these equations, it is recommended that the equation for other ethnicities be used. Industry has been involved in the development of these equations and most spirometric equipment manufacturers will easily be able to add these to their software programs if not already provided. It is important to note that there is higher intra-subject variability among children than among adults. The between-subject coefficient of variation for FEV1 decreases from 17% at 3 years to 11% at 20 years. The lower limit of normal for % predicted FEV1 is 66% for a 3-year-old and 78% for a 20-year-old. [32,33] It is therefore recommended that results in children should be expressed as Z-scores or centiles. As disease severity-grading currently uses % predicted, it may be useful for clinicians, if both Z-scores and % predicted are included on spirometry reports. 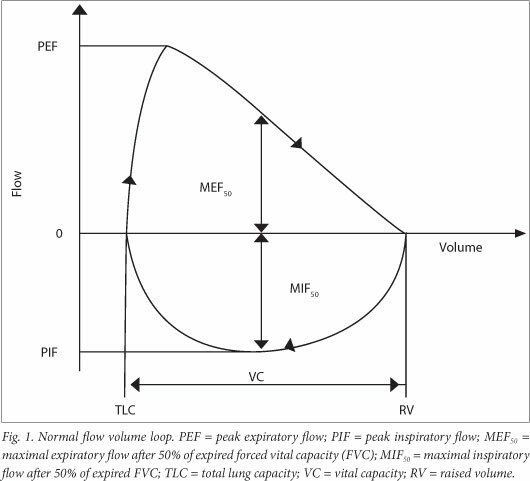 There is a disproportionate reduction of maximal airflow from the lungs in relation to maximal volume expired during the forced manoeuvre, defined as FEV1/FVC or FEV0.5/FVC below the 5th percentile of the predicted or <80%. 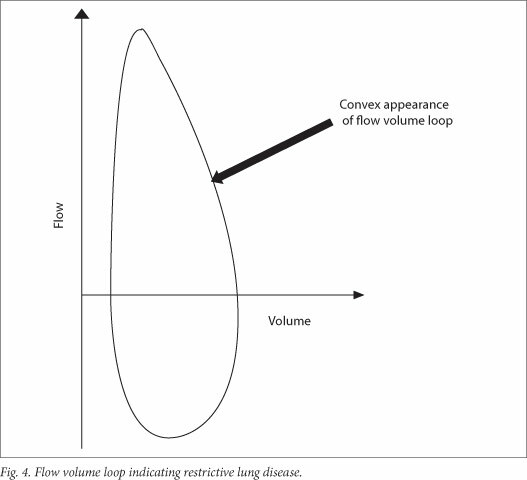 This gives a concave appearance to the flow volume loop (Fig. 1). When FEV1 and FVC are both concomitantly decreased, it suggests that the patient did not inhale maximally or exhale long enough. If there is central and upper airway obstruction, there is a reduction in PEF and increased FEV1/PEF. 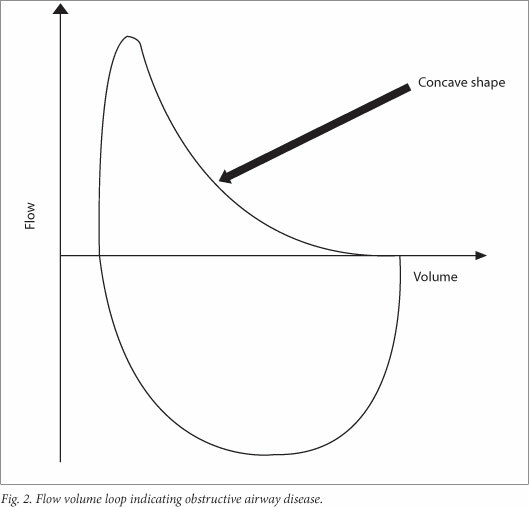 This can be observed as a reduction in size, which is observed on both the forced inspiratory and expiratory flow loops. 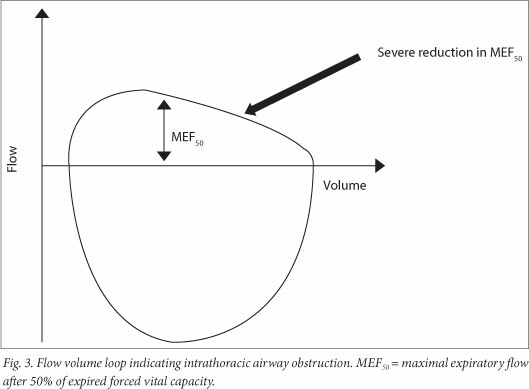 In extrathoracic airway obstruction, the reduction is pronounced for the maximum inspiratory flow volume loop, while in intrathoracic airway obstruction, reduction is pronounced in the MEF50 (Fig. 3). 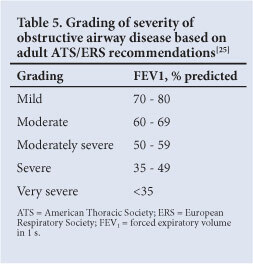 The assessment of severity of obstructive defects is based on the % predicted FEV1 (Table 5) and is based on adult studies. • % predicted FVC is <80% then this demonstrates a restrictive pattern. In severe obstructive disease FVC may be <80% and the FEV1/FVC would also be decreased. A mixed lung function abnormality describes the coexistence of obstruction and restriction. Children with this pattern will have both a reduced FEV1/FVC and FVC >80% predicted or <5th percentile of predicted. The reduced vital capacity could be either due to hyperinflation or a restricted lung volume. This is important to understand in the interpretation of the test. Treatment of reversible obstruction may aid assessment. Accurate assessment of lung volumes with plethysmography would define the pattern more clearly. Spirometry has the disadvantage of being relatively insensitive in detecting early lung disease where FEV1 is still relatively preserved, e.g. in cystic fibrosis. There are newer techniques for the measurement of lung function; particularly where spirometry is difficult to perform or is too insensitive to measure early lung disease. These include infant spirometry (raised volume rapid thoracoabdominal compression (RVRTC)), plethysmography, multiple breath inert gas washout tests, forced oscillation technique and the interrupter technique. These are beyond the scope of this guideline and will be discussed in Part 2 of this series on paediatric lung function testing. Performance of reliable lung function testing in children is possible. There are specific protocols that need to be followed in terms of calibration of equipment and quality assurance measures to ensure that reliable and reproducible spirometry is performed in children. This guideline has provided some guidance for performing spirometry in South African children. There is an urgent need to collect data on South African children to have local reference ranges to ensure quality of data collected. Acknowledgements. We acknowledge the contribution of Proff Graham L Hall and Heather Zar for their critical review of the manuscript and constructive suggestions, which have improved the quality of the guideline.